Next week will be Saint Patrick's Day and for the first time since we've been in Costa Rica, we have a corned beef brisket ready to cook to celebrate this American Irish holiday. 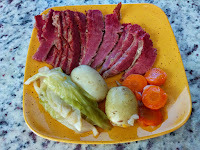 I had been hungry for some corned beef brisket for a few years now, and decided a couple of weeks ago we really needed to try our hand at making a brine and home curing a brisket. This is amazingly easy if you have the 10 days of preparation time. This is not something you decide to make from one day to the next. The first challenge was to locate all the spices I would need for the brine solution. I had enough Prague Powder #1 (InstaCure Pink Salt) on hand that our daughter had brought from the States, so I just needed to track down the rest of the spices. It turned out most of the ingredients can be found at our local spice vendor's booth at our Feria (Farmers' Market) every Friday morning. I was able to find a couple of the spices he didn't carry at the Mercado Central (central market) in Alajuela, including a new local source for the Prague Powder #1, called "Sal de Cura" at vendor booth #34. The only spice I couldn't locate was juniper berry. With just a little research I found sprigs of Rosemary make an acceptable substitute, and the Rosemary will impart the same earthy pine flavor and scent as a juniper berry. If you have the time to brine, and you're ready to try your hand a making a home cured corned beef brisket, here's how to do it. Thoroughly mix all the spices together and store in an airtight jar. Place the water into a large 6 to 8 quart stockpot along with salt, sugar, Prague powder, and all the spices. Cook over high heat until the salt and sugar have dissolved. Remove from the heat and add the ice. Stir until the ice has melted. If necessary, place the brine into the refrigerator until it reaches a temperature of 45 degrees F. Once it has cooled, place the brisket in a 2-gallon container (or zip top bag) and add the brine. Seal the container, and refrigerate for 10 days. Check daily to make sure the beef is completely submerged, turn it over as necessary and stir the brine. After 10 days, remove from the brine and rinse well under cool water and remove the old spices. I recommend the brisket be soaked in cold water for 2 hours to remove some of the saltiness. At this point you can freeze the brisket in a vacuum sealed package, or cook it. When you are ready to cook, place the brisket into a pot just large enough to hold the meat, cover with water, bring to a boil and reduce to low for 30 minutes to remove salt. Pour off all the salty water, add the onion, carrot and celery and cover with water by 1-inch. If you like additional spice, add 1 tablespoon of the leftover mix. Set over high heat and bring to a boil. Reduce the heat to low, cover and gently simmer for 2½ to 3 hours, or until the meat is fork tender. If you want, you can add cabbage and potatoes during the last 45 minutes of cooking. Remove from the pot and thinly slice across the grain.